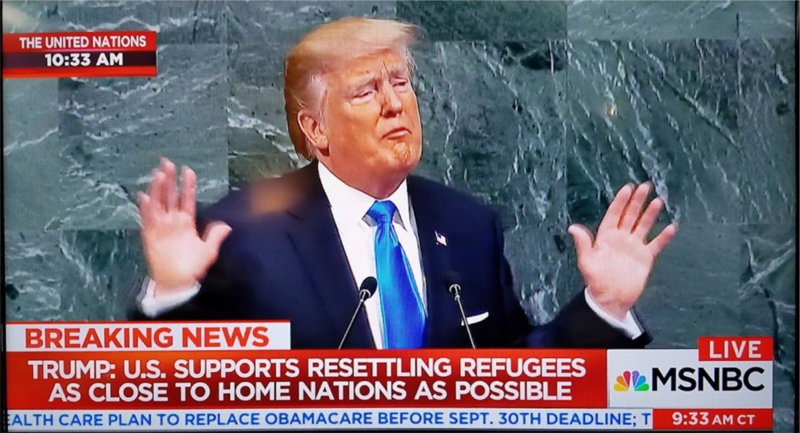 Lionel Deimel’s Web Log: Impressions of Donald Trump’s Speech to the U.N. I watched President Donald Trump’s speech to the United Nations General Assembly this morning. I would like to offer a few observations of his performance. By no means is this intended to be a full-blown analysis of the speech. I only want to mention a few things that stood out for me. I’m sure that much analysis will be forthcoming from others in the next 24 hours. First, I must say that Trump is annoying to watch. He is incapable of adjusting his delivery style to the circumstances of a given speech. He addressed the U.N. in the same fashion as he addresses his rallies. His delivery is always a barely controlled scream that, perhaps except for his most ardent supporters, is hard to listen to. Watching Trump before the General Assembly reminded me, for whatever reason, of Fidel Castro’s addressing the body. Happily, Trump read from teleprompters and avoided—I sure he was warned to avoid at all costs—his notorious ad libs. His habit of driving home a point through repetition of a word or phrase, or his habit of interjecting his unfiltered innermost thoughts that seem to step all over his message was inappropriate before the General Assembly. Unfortunately, his use of teleprompters has an annoying side effect. The president looks back and forth to read his text, never looking toward the people directly in front of him. Moreover, when he reads from the left screen, his left hand, with open palm, moves up and down like an American maneki-neko. When he reads from the right, his left hand disappears and his right hand does his little Japanese wave. I suspect that Trump would be struck mute were his hands in cuffs behind his back. Trump attacked numerous countries by name, some—Cuba for instance—rather gratuitously, I thought. Under the circumstances, one might have expected an American president to say a few negative words about the Russian Federation’s behavior, particularly as regards our most recent national election. One would have been disappointed. At least Trump avoided saying what a great leader Vladimir Putin is! For the Democratic People’s Republic of Korea, he saved his biggest insult and most frightening threat. He referred to Kim Jong-un as “Rocket Man.” This was, no doubt, intended as an insult and was a shocking departure from what one normally expects in diplomatic discourse. On the other hand, I am not altogether certain that Kim would dislike the sobriquet. (Actually, he might prefer “Nuke Man!”) More worrisome than what seemed a violation of good manners was Trump’s suggestion that, to protect the U.S. or its allies, the president might have “no choice” but to “totally destroy North Korea.” I don’t know if this scared Kim, but it certainly had me thinking about fallout shelters and life after the apocalypse. Someone needs to give this man a shot of testosterone blocker! Another primary target of our fearless leader was, not surprisingly, Iran. As he has so often, he criticized the Iran nuclear agreement as a terrible deal and intimated that he might withdraw the United States from it. This is problematic, since the agreement is multilateral, not bilateral. Nevertheless, Israel Prime Minister Benjamin Netanyahu, who was sitting in the General Assembly, was nodding his head in approval. The reality is that the perfect is the enemy of the good. An agreement involving both nuclear weapon and missile development might have been a more desirable one, but repressing Iranian nuclear weapon development is nevertheless a very good thing in and of itself. Trump spoke instead as though he believes that the current agreement enhances Iran’s prospects for getting the bomb. The agreement does not run forever, but, for now, it seems like a good thing to everyone except Trump and Netanyahu. For me, the most surprising part of Trump’s speech concerned refugees. It seems that the president has found a way to justify his unwillingness to bring Middle East refugees to this country. It is expensive, he asserted, to resettle refugees in the United States. The money we might spend in resettlement would go further settling refugees closer to where they used to live. Ah, such a charitable man! Trump made his usual complaints about trade agreements, suggesting that they are invariably not in our own interest. I need hardly say more about this. The speech was more laundry list than focused address, perhaps because many hands had a part in preparing it. If one were to search for an overall theme, what would be found is a somewhat schizophrenic one: countries should all work together for a better world, but each country should put its own interests first. This seems more about justifying Trump’s own America-first philosophy. It sounds like a plan for us all to retreat into our secure corners and have as little to do with one another as possible. This is not the world I want. Presidential speeches to the General Assembly are, at their very best, inspiring. President Trump’s speech was anything but that. It was, however, supremely frightening. can you read this book Fire and Fury: Inside the Trump White House By Michael Wolff Get it Now﻿ Hardcover, Paperback, AudioBook, Or Audio CD.